Cordyceps are among the most powerful medicinal mushrooms used in traditional Chinese medicine, and have been around for centuries. Yet they remained virtually unknown to the rest of the world until 1992, when the Chinese women’s track team broke multiple records and partly attributed their success to the fungi. There are many cordyceps health benefits. In fact, studies have found that cordyceps are natural energizing adaptogens that boost immunity, prevent weakness, fight fatigue and stress, and improve exercise performance. These fungi are also prized for their natural ability to fight infections, inflammation, and free radicals, and have a reputation as a longevity-promoting herb. Read on to learn more about the health benefits, as well as cordyceps uses and side effects. What are cordyceps? Although cordyceps (Cordyceps sinensis) are closely related to other mushrooms, they are actually classified as the health-promoting ascomycete fungi. Other names for cordyceps include semitake, yarsha gumba, hsai ts-ao tung ch-ung, and dong chong xia cao. Cordyceps grow in the Tibet region in a process that is very interesting. As a parasitic fungus, the mushrooms will develop on a type of caterpillar before eventually consuming over 90% of the infected insect, often in the winter. In the summer, the fungus will swell up into a little mushroom plant that grows about six inches and weighs between 300 and 500 milligrams (mg). This is likely why they are also called the Chinese caterpillar fungus or vegetable caterpillar. Cordyceps originated in traditional Chinese medicine about 5,000 years ago—they’re one of the world’s oldest “superfoods.” The health benefits of cordyceps were first described in ancient Chinese medical texts, and folk healers have used them alone or combined with other Chinese herbs to fight various diseases. They have also been featured in Christian, Hindu, and Chinese religious ceremonies as symbols of immortality and longevity. Some of the first people to discover the mushrooms’ benefits observed animals growing strong after eating the wild fungus. 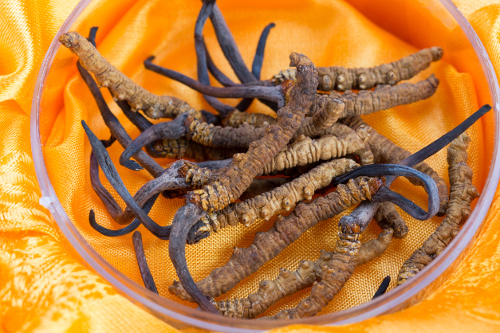 Herders and farmers would later use cordyceps powder for tonics and teas to help increase milk production and reproductive capacity of their livestock. Others later began drying them in the sun to preserve their many benefits. There are many important cordyceps mushroom benefits. For instance, cordyceps are touted as the ultimate supplement for bringing the immune system back to normal function after life-threatening illnesses or infections. Research shows that the mushrooms can act like a mild stimulant that can increase energy, boost immunity against viruses, and fight chronic fatigue and stress. Cordyceps are used to help treat dizziness, muscle weakness, liver disorders like hepatitis B, heart disease and high cholesterol, an irregular heartbeat and low circulation, asthma, bladder and urination problems, kidney disorders, sexual dysfunction, and respiratory infections like chronic bronchitis, colds, coughs, and the flu. Let’s take a deeper look at the potential health benefits. Several studies suggest that cordyceps improve endurance and stamina, and this is partially due to their ability to boost one of the top sources of energy during exercise called ATP (adenosine triphosphate). The mushrooms contain an important nucleic acid needed to make ATP called adenosine. Studies have found that higher ATP production helps athletes keep up with intense workouts and extend the timeframe during which they can stay active at a high level. ATP is also thought to improve how the body uses oxygen during exercise. A synthetic strain of cordyceps is called CS-4. A study published in the Journal of Alternative and Complementary Medicine in 2010 found that CS-4 cordyceps could improve exercise performance in older adults aged 50 to 75 years old. Another study published in the Chinese Journal of Integrative Medicine in 2004 found that VO2 max had increased by seven percent in participants who had taken CS-4 cordyceps, and a placebo had shown no change. VO2 max is a measurement that determines fitness level. There is another study published in the Journal of Dietary Supplements in 2016, which found that VO2 max had increased by 11% with a cordyceps-containing mushroom blend in younger adults during exercise performance when compared to a placebo. The positive impact of cordyceps on the immune system may also benefit reproductive, endocrine, respiratory, and cardiovascular systems. The polysaccharides in them, cyclosporines and modified nucleosides, could potentially help fight cancer and immunological disorders. Cordyceps have the potential to slow tumor growth. A study published in the journal Anticancer Research in 2010 found that they stopped the spread of cancerous melanoma cells in the livers of mice. In test-tube studies, cordyceps have also been found to inhibit the growth of various human cancer cells, including skin, colon, liver, and lung cancers. Mice studies have also supported the anti-tumor effects of cordyceps on lymphoma and lung cancer. Other studies show that taking cordyceps during or after chemotherapy may increase the body’s defense mechanisms and reduce symptoms from the treatment. One side effect of chemotherapy is leukopenia—a condition associated with a reduction in white blood cells that increases your risk of infection. A 2009 study published in the journal Experiments in Biological Medicine found that cordyceps had reversed leukopenia in mice that developed the condition after radiation and being treated with a common chemotherapy drug called “Taxol”. The results suggest that cordyceps may help decrease complications associated with certain cancer treatments. Throughout time, both men and women have enhanced their libido and reproductive function by taking tonics made from cordyceps. As a result, this medicinal mushroom is often used as a natural treatment for impotence and infertility. This is because it may improve endurance, reduce inflammation and fatigue, increase blood flow, and help the body utilize oxygen more efficiently. Cordyceps have also been shown to benefit liver function, and may be useful for people with damaged liver disorders like hepatitis B. An eight-week study published in the Acta Pharmacologica Sinica journal in 2014 found that daily administration of cordyceps significantly improved signs of liver disease in mice with chronic kidney disease. The positive effects of cordyceps could improve the liver and allow for better digestion and utilization of fatty acids. Cordyceps contain powerful anti-aging properties that help reduce wrinkles, blemishes, and age spots; eliminate dry or dead skin; and help rejuvenate the skin overall. Researchers believe that the antioxidant content may explain the anti-aging potential of cordyceps. In a study published in the FASEB Journal in 2011, researchers examined the effects of CS-4 cordyceps on lifespan and age-related changes in gene expression in mice. The results revealed that CS-4 cordyceps had extended the lifespan of mice by one to 66 days at 50% survival and by 45 to 153 days at 10% survival. It also reversed many age-related changes of gene expression. This supports the traditional belief that CS-4 cordyceps have anti-aging effects. Another 2015 study suggests that cordyceps can extend the lives of fruit flies, which adds further evidence to the anti-aging benefits of cordyceps. Diabetes is a disease in which the body does not produce or respond to insulin, which is a hormone that transports blood sugar to your cells for energy. As a result, sugar stays in the blood, and this can lead to complications such as kidney disease, eye disease, nerve damage, gum disease, amputations, heart disease, depression, and autoimmune disorders like rheumatoid arthritis and thyroid disease. A number of diabetic mice studies have found that cordyceps reduce blood sugar levels, while other evidence suggests that cordyceps may protect against kidney disease—one of the complications of diabetes. A review of 22 studies including 1,746 people with chronic kidney disease, published in the Cochrane Database of Systematic Reviews in 2014, found that those taking cordyceps supplements had improved their kidney function. There is also research showing that cordyceps benefit heart health. Cordyceps are approved in China for treating heart arrhythmia—a condition where the heartbeat is irregular, or too fast or too slow. A study published in the journal Acta Pharmacologica Sinica in 2014 found that cordyceps significantly decreased heart injuries in rats with chronic kidney disease. Heart injuries from chronic kidney disease are known to increase heart failure risk; therefore, reducing heart injuries from chronic kidney disease may help you avoid heart failure. The adenosine content in cordyceps is thought to contribute to the heart-protective effects of these fungi. Other research shows that cordyceps reduce levels of triglycerides—a type of fat in the blood. High levels of triglycerides are linked with a higher risk of heart disease. Cordyceps can help reduce LDL (low-density lipoprotein), or “bad” cholesterol, and increase HDL (high-density lipoprotein), or “good” cholesterol; as a result, the fungi help protect the heart and prevent against strokes, heart attacks, and atherosclerosis. LDL cholesterol is known to increase one’s heart disease risk due to the buildup of cholesterol in the arteries. A study published in the journal Biological and Pharmaceutical Bulletin in 2003 found that 300 mg of cordyceps reduced total cholesterol, LDL cholesterol, and VLDL (very low-density lipoprotein) levels and increased HDL cholesterol in rats. Cordyceps mushrooms can also fight inflammation in the body. Excessive inflammation can lead to diseases like cancer and heart disease. Studies have shown that special proteins that increase inflammation become suppressed when human cells are exposed to cordyceps. Researchers believe cordyceps may be used as an anti-inflammatory drug or supplement. Research published in the journal of Pediatrics and Neonatology in 2008 found that cordyceps reduce inflammation in the airways of mice; as such, these medicinal mushrooms may be a potential therapy for asthma. Other studies show that cordyceps can reduce skin inflammation when applied topically in mice, which further demonstrates the anti-inflammatory properties of cordyceps. Cordyceps haven’t always been available to the general public. Those lucky enough to secure the fungi often paid a hefty price for the privilege. Today, wild cordyceps are still not easy to find; however, scientists have made them more available and affordable to the public by synthetically reproducing them in a laboratory. This process also controls contamination, including exposure to harmful heavy metals and bacteria. Most health food stores also carry cordyceps powders, capsules, and tablets. In general, to prevent illness or boost immunity, use the mushrooms once or twice weekly in low doses. What are the side effects of cordyceps? Although there are many health benefits and the mushrooms are considered safe for most people, there are also some cordyceps side effects to keep in mind. For instance, their safety is not confirmed in breastfeeding or pregnant women; therefore, it is best to consult a doctor before using them. Another cordyceps precaution some doctors also warn about is that the mushrooms might worsen autoimmune diseases such as multiple sclerosis, rheumatoid arthritis, and lupus. Their immune-boosting abilities may overactivate certain immune cells or interfere with drugs for these autoimmune diseases. Medicinal mushrooms like cordyceps may also interfere with proper blood clotting, and people with blood clots or bleeding disorders should use caution as well. Cordyceps are among the more popular medicinal mushrooms, and have been used to treat various diseases for thousands of years. They are often touted as the world’s most powerful superfood, as scientific and anecdotal evidence suggests they can boost immunity, improve athletic performance and stamina, enhance libido, fight tumors and reduce cancer treatment symptoms, manage type 2 diabetes, fight inflammation, and promote heart health. Cordyceps also contain anti-aging properties that could help rejuvenate the skin; reduce blemishes, wrinkles, and age spots; and eliminate dead or dry skin. However, due to limited research on humans, there is no consensus on how much cordyceps you should take. That being said, the most effective dosage used in research that is not associated with side effects ranges from 1,000 mg to 3,000 mg daily. “9 Interesting Benefits of Cordyceps,” Organic Facts; https://www.organicfacts.net/health-benefits/other/cordyceps.html, last accessed April 21, 2017. “Cordyceps,” Dr. Weil; https://www.drweil.com/vitamins-supplements-herbs/herbs/cordyceps/, last accessed April 21, 2017. “Studies with Cordyceps sinensis,” Earthpulse; http://www.earthpulse.com/src/subcategory.asp?catid=11&subcatid=55, last accessed April 21, 2017. “7 Powerful Health Benefits of Cordyceps Mushroom,” Epigentic Labs; https://epigeneticlabs.com/cordyceps-mushroom/, last accessed April 21, 2017. “Cordyceps (Dong Chong Xia Cao),” ActiveHerb; https://www.activeherb.com/cordyceps/, last accessed April 21, 2017. “Cordyceps sinensis,” Shen Nong; http://www.shen-nong.com/eng/herbal/cordyceps.html, last accessed April 21, 2017. Chen, S., et al., “Effect of Cs-4 (Cordyceps sinensis) on exercise performance in healthy older subjects: a double-blind, placebo-controlled trial,” Journal of Alternative and Complementary Medicine, May 2010; 16(5): 585-590, doi: 10.1089/acm.2009.0226. Liu, X., et al., “Cordyceps sinensis protects against liver and heart injuries in a rat model of chronic kidney disease: a metabolomic analysis,” Acta Pharmacologica Sinica, May 2014; 35(5): 697-706, doi: 10.1038/aps.2013.186. Kubo, E., et al. “Inhibitory effect of Cordyceps sinensis on experimental hepatic metastasis of melanoma by suppressing tumor cell invasion,” Anticancer Research, September 2010;30(9):3429-3433. https://www.ncbi.nlm.nih.gov/pubmed/20944118. Panda, A., et al., “Traditional uses and medicinal potential of Cordyceps sinensis of Sikkim. Journal of Ayurveda and Integrative Medicine,” 2011;2(1):9-13. https://www.ncbi.nlm.nih.gov/pmc/articles/PMC3121254/. Hirsch, K.R., et al., “Cordyceps militaris improves tolerance to high intensity exercise after acute and chronic supplementation,” Journal of Dietary Supplements, July 2016, 1-1; doi: 10.1080/19390211.2016.1203386. Liu, W., et al., “Cordyceps sinensis Health Supplement Enhances Recovery from Taxol-Induced Leukopenia,” Experiments in Biological Medicine, April 2008; 233(4): 447-455, doi: 10.3181/0708-RM-230. Tan, N., et al., “The lifespan-extending effect of Cordyceps sinensis Cs-4 in normal mice and its molecular mechanisms,” The FASEB Journal, April 2011; https://www.fasebj.org/doi/abs/10.1096/fasebj.25.1_supplement.599.1. Zou, Y., et al., “Cordyceps sinensis oral liquid prolongs the lifespan of the fruit fly, Drosophila melanogaster, by inhibiting oxidative stress,” International Journal of Molecular Medicine, July 2015; 36(4): 939-946, doi: 10.3892/ijmm.2015.2296. Zhang, H., et al., “Cordyceps sinensis (a traditional Chinese medicine) for treating chronic kidney disease,” Cochrane Database of Systematic Reviews, Dec. 2014;(12): CD008353, doi: 10.1002/14651858.CD008353.pub2. Okh, J., et al., “Hypocholesterolemic Effect of Hot-Water Ectract from Mycelia of Cordyceps sinensis,” Biological and Pharmaceutical Bulletin, 2003, 26(1): 84-87, doi: 10.1248/bpb.26.84. Gao, J., et al., “lipid-lowering effect of cordycepin (3’-deoxyadenosine) from Cordyceps militaris on hyperlipidemic hamsters and rats,” Yao Xue Xue Bao, June 2011; 46(6): 669-676, PMID: 21882527. Hsu, C., et al., “Effects of the immunomodulatory agent Cordyceps militaris on airway inflammation in a mouse asthma model,” Pediatrics and Neonatology, Oct. 2008; 49(5): 171-178, doi: 10.1016/S1875-9572(09)60004-8. Won, S., et al., “Anti-inflammatory and related pharmacological activities of cultured mycelia and fruiting bodies of Cordyceps militaris,” Journal of Ethnopharmacology, Jan. 2005; 96(3): 555-561, doi: 10.1016/j.jep.2004.10.009.